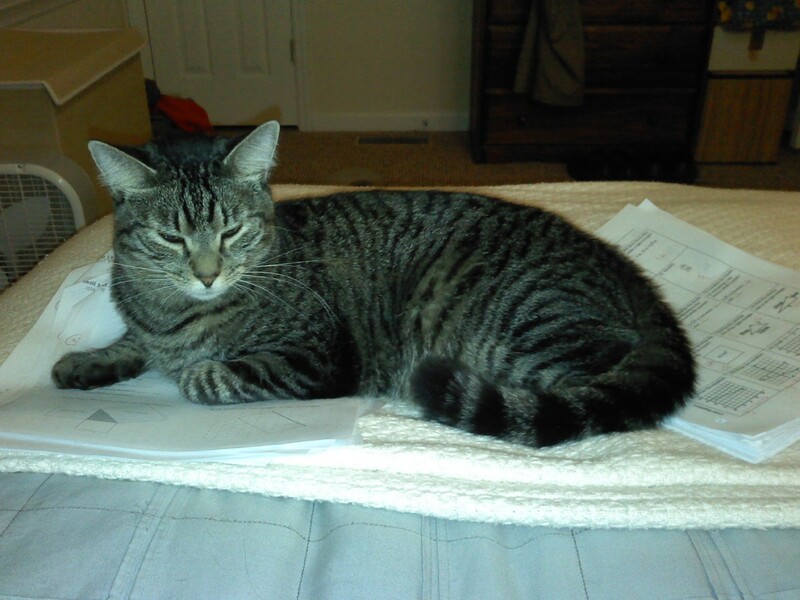 I had a history professor one time who claimed that he used his cat to grade his students’ papers. 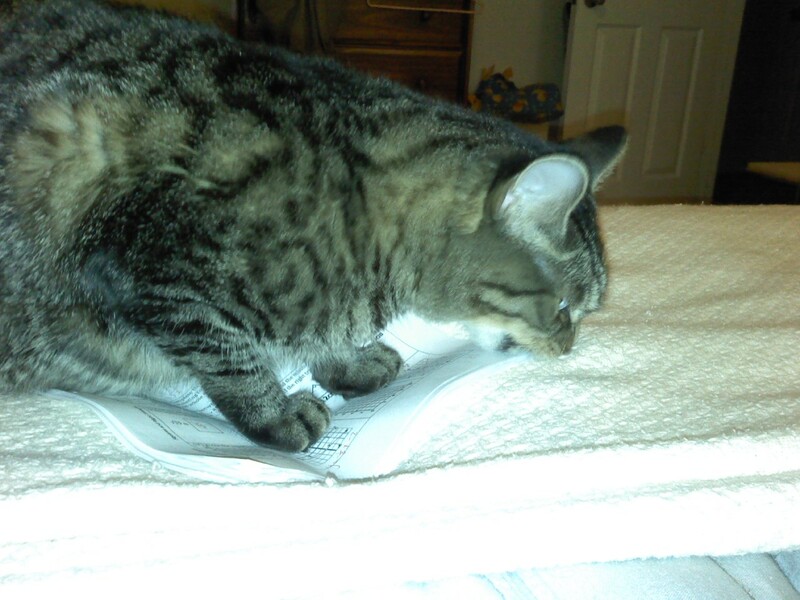 He would throw them on the floor across the room, and the ones his cat would sit on would receive the highest grades (or lowest grades, depending on his mood or the cat’s mood). 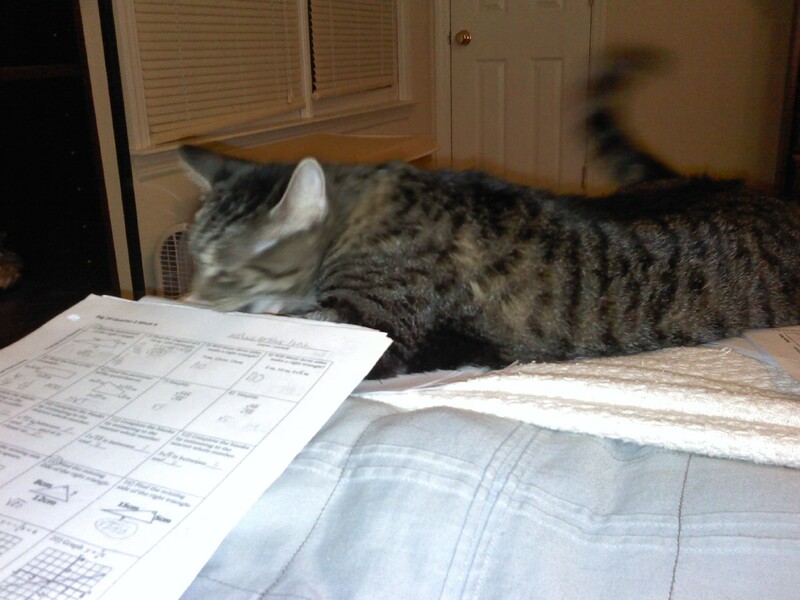 I was in bed last week grading papers, and Amos decided to help out. I think he was really just jealous of the attention I was giving the papers. I’ve been procrastinating writing this post for five days, and I’m still not sure exactly what to write. This post is perhaps more for me than for anyone else, but you’re invited to be part of my journey. Rarely does someone you know pass away, and rarely does their death have as great an impact as the death of Chad Paxson. Chad was a 6th grade social studies teacher and greatly involved in athletics. We taught together my first year when I was on the 6th grade team. Before that he taught 7th grade social studies, and I had subbed for him once or twice before beginning to teach at my school. He was in his mid-30’s. On Friday afternoon between classes, Chad collapsed in the hallway without a pulse. The teachers around him called 911 and performed CPR. The school was placed on a soft lockdown, meaning everyone was restricted to their classrooms to keep the hallways clear. Chad was rushed to the hospital, but died despite all attempts to save him. Many of the 6th grade students knew sketchy details of what happened, but most of the rest of the school did not know anything, including many of the teachers. Of course, this didn’t last much beyond the last bell of the day. Our principal was at the hospital with Chad’s wife, so our AP called us to the media center to share the news. The faculty was overtaken by shock, disbelief, and profound sadness. Despite the incredible amount of grief, this entire experience has made my extremely proud of my colleagues, my students, and my school district. Our administration worked closely with district support personnel (counselors, social workers, and psychologists) to get ready for school on Monday. Schools from all over the district loaned us their counselors to help support our students this week. There was a care center set up in the media center for students and faculty to visit and grieve. The elementary and middle school counselors that handled student grief in the care center did a truly phenomenal job. 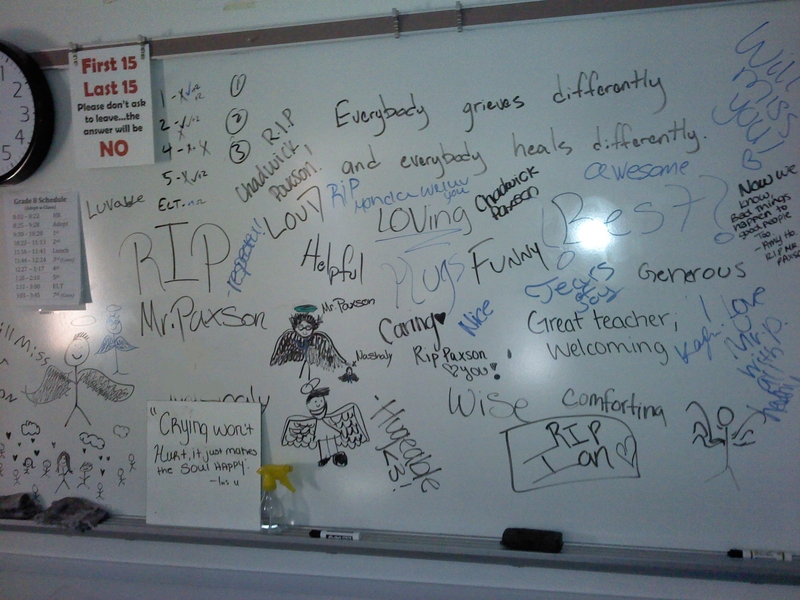 We spent the first hour of the day with our homerooms, sharing memories, crying, and supporting one another. I cried as I read a prepared statement to my students. More than a third of the 8th grade students had Chad as a teacher, many knew him as a coach, and almost every student in the school knew who he was. I was so proud of the way my students handed themselves. A few wanted to express their emotion by making cards to go in a Remembering Box for the family. 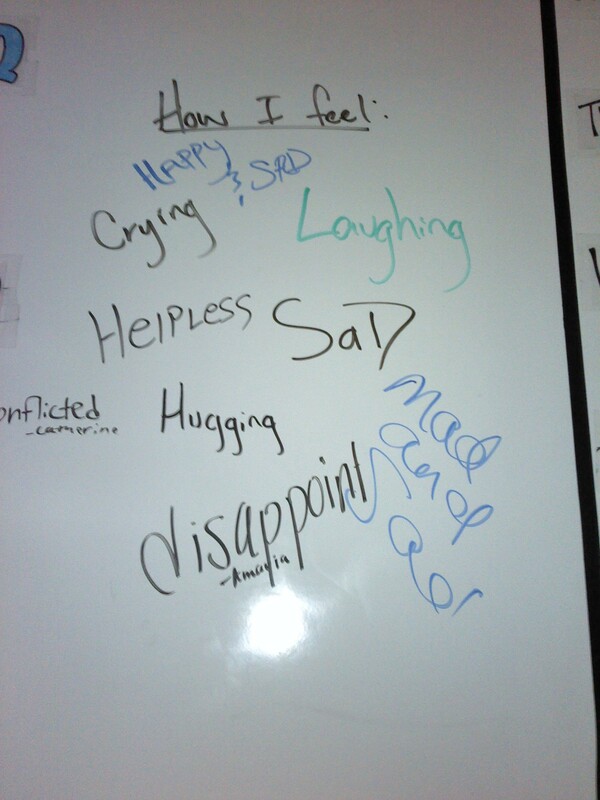 Several others decided to use the whiteboard to express their feelings. 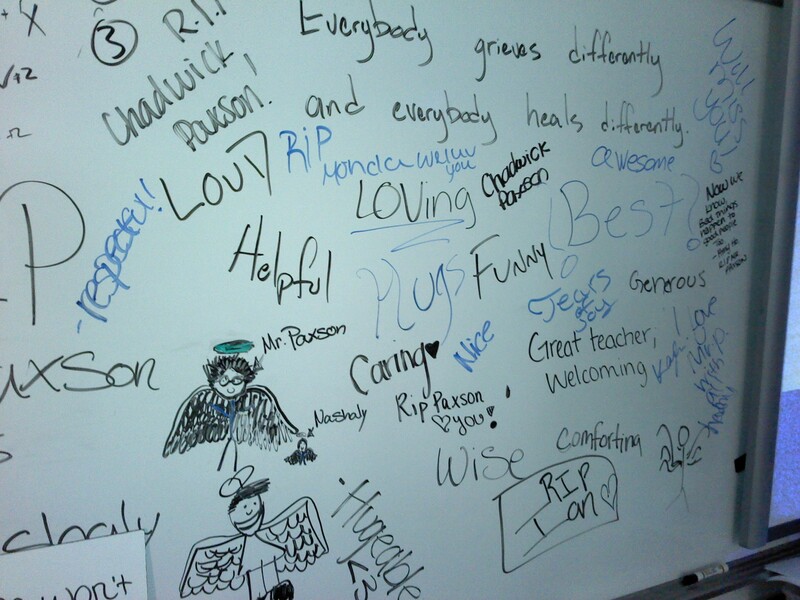 We used part of the board for words and pictures to describe Chad, and another part for words to describe how we were feeling. One of my students, one who didn’t know Chad, had the idea to create a banner for everyone in the school to sign; we got the supplies and made it before leaving homeroom, and I made sure to have our principal pull her out of class to help hang it that afternoon. My favorite story of the day came via our principal from Chad’s classroom. Our principal, AP (a truly gifted former teacher), and a counselor spent the day in his classroom with his students. The 6th grade schedule had the students in homeroom for an hour, then in their Connections class for an hour, and then back with their homeroom teacher for an academic class. When Chad’s homeroom students returned after Connection, the principal/AP/counselor asked them what they wanted to do in class, and they replied very definitively that they wanted to “Do social studies” because that is what Chad would have wanted them to be doing. So, our AP taught each of Chad’s classes social studies on Monday. Students throughout the school improved as the day continued. Yesterday (Tuesday), we followed a normal schedule, and for the most part students rose to our expectations to continue school. Today was Chad’s funeral. Our principal was extremely compassionate, and without hesitation told the faculty on Monday morning that whoever wanted to attend would be able regardless of the time. It was in the middle of the school day, but the district provided subs for the 40+ teachers who attended, as well as about a dozen district administrators to help out at school during the day. We had numerous students absent today to attend the funeral, and the service was packed. Chad and I never talked deeply about faith, although I know his family attend the same church Hannah and I attend, and his children were in VBS there last summer. Our prayer during this ordeal has been for the Lord’s glory to shine through the darkness of this tragedy and for Him to reveal His presence to those who knew Chad. I’m confidant that Chad would be delighted knowing that, due to his death, others became believers in the message of Christ. The Gospel of John records these words of Jesus: “For God so loved the world that he gave his one and only Son, that whoever believes in him shall not perish but have eternal life. For God did not send his Son into the world to condemn the world, but to save the world through him” (John 3:16-17). We will continue to move forward because that is the way God would have us live our lives to show His love to the world. Update: The Athens-Banner Herald has an article about Chad’s funeral. I’m out of the classroom at least once a month for professional development or a meeting of some sort. Today, I had a Middle School Instructional Council meeting for the second half of the day. Whenever possible, I try to get Mrs. Hussain to be my sub. She is the World’s Best Sub. She knows my students, or at least the stories I tell about them, so she’s always interested in meeting them. She can ask me questions about my lesson plan the night before, which means she is a sub who KNOWS WHAT IS SUPPOSED TO HAPPEN during class. She also is my wife, which means the students know I will see her that night and she will tell me everything that happened. Me: I will be absent tomorrow due to a district meeting. Mrs. Hussain will be your substitute. Boy 1: [turns to friend] Aw, man! We’re going to have to be good. She’s going to tell him everything! I love my students, even Boy 1.